The LG G Pro 2 is a very good option for anyone looking to buy a large screen high-end/premium Android phone. The G Pro 2 offers a good feature set, impressive performance and a very aggresive price tag. Samsung Galaxy Note 3 has some serious competition and Note 3 aspirers should give the G Pro 2 a hard look before deciding on which large screen Android smartphone to buy. Frankly, we are baffled beyond wits here. LG's official price for the G Pro 2 is Rs. 51,500, which is super steep. However, a stroll through the major e-commerce websites reveals discounted prices ranging from approximately Rs.35,600 to Rs. 48,500. The G Pro 2 is an absolute steal if we consider the low end of that price range, but there's no telling how long it will be available so cheap. Without considering such a steep discount, the G Pro 2 goes right up against the Samsung Galaxy Note 3, which comes with an S-Pen stylus but lacks 4K video recording. All said and done, the G Pro 2 is definitely a good alternative, but it just falls short of being our first choice. LG G Pro 2 Review: The new interim king of phablets? The G Pro 2 is the only real challenger to Samsung’s Galaxy Note 3. It might not be the best, especially with its dated UI and lack of an S-Pen alternative, but it can definitely hold its own against the latter. However, the G Pro 2 comes six months after the Note 3 was released, which is a long time in the smartphone industry. So, should you buy the G Pro 2 over the Note 3? Yes, if you don’t mind LG’s slow update schedule and the lack of any S-Pen alternative on the handset. The brilliance of the LG G2 took everyone by surprise, but now the company's achieved it once, expectations for every one of the companies future phones have risen dramatically. But the battery life is a problem. We weren't necessarily expecting the sort of power-sipping that the G2 demonstrated, but we were expecting (and always expect) a full day of moderate use. The G Pro 2 can't manage that, and that leaves the Galaxy Note 3 safe in its position as best phablet in the world - at least for now. Compared to its predecessor, the G Pro 2 features a faster quad-core processor from Qualcomm and a larger battery. The smartphone performed smoothly, without any crippling lags or crashes. I didn’t run a formal battery test, but with moderate to heavy usage, I was able to go about a day and a half before needing to recharge the phone. LG has made some nice improvements to the G Pro 2 to make it a better smartphone. With competitive pricing, it can be a nice alternative to the Galaxy Note 3. Bottom line here, the LG G Pro 2 appears to be an all around solid performer and it held up well in our day to day use. The display was solid, and battery life proved nothing to worry about. Not to mention the overall build quality -- which was more than acceptable. We also especially liked the camera, and the camera options. Plus, in a world where many Android users are looking to get a clean and stock experience, we are more than willing to ditch the stock experience in favor of the perks offered by LG. We still need some more details in terms of a US release. Namely, a date, some pricing and carrier specifics. But if nothing else, we do feel the LG G Pro 2 should be a handset to consider once it comes available. The large-screen smartphone market is now one of the most fiercely competitive in the wireless industry. But even though nearly every phone maker has produced a competitor to the Samsung Galaxy Note, only a handful of products have actually been worth considering. With a solid construction, good battery life and plenty of firepower, the G Pro 2 is a contender for the best large-screen phone on the market. LG has taken a great device in the LG G2 and has blown it up to a much larger size in the LG G Pro 2. Again, this isn’t so much a follow-up to last year’s LG G Pro, but a compliment to the LG G2 instead. Working with one of the finest processors on the market and a display that’s both sharp and bright in essentially any environment, there’s little to dislike about this handset. 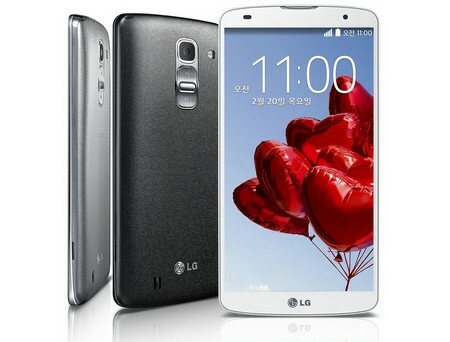 The LG G Pro 2 is LG’s top product in the large-display phone category, and it comes with LG’s latest refinements in terms of camera and user-interface. Overall, it can be considered as a larger version of the excellent G2 smartphone If you are looking to get a large phone, this is a device that we warmly recommend considering. But while the original G Pro was clearly advantaged by its newer hardware when compared to the Galaxy Note 2, the G Pro 2 is running neck to neck with the Galaxy Note 3 instead, so the choice isn’t as obvious.